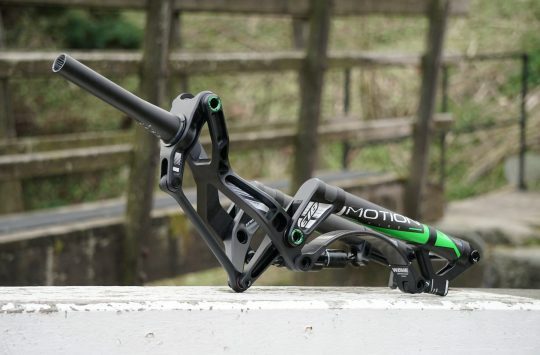 As seen at Roc d’Azur last month, new French brand Motion is looking to bring back the much-loved, much-maligned parallelogram* suspension fork. Since mountain biking’s early days, companies like AMP and Girvin touted the precise-tracking and up-and-back travel benefits of parallelograms for front suspension use. Interloc Racing and USE improved on the idea with anti-dive geometry, while Muddy Fox and Whyte integrated their models into the frame. But small brands like those mentioned often have difficulty keeping up with more established players in terms of distribution, damper technology, and manufacturing costs, while riders are often reluctant to embrace such visually unique products – factors that have led many of those companies to insolvency or self-preserving moves toward off-the-shelf designs. Or maybe their ideas were just crap. Either way, since the ‘anything goes’ 1990s, parallelogram forks have become a rare sight indeed. So why bring back the parallelogram? Well the wheel path is a good reason – forks that allow the wheel move up and back are in theory better able to respond to bumps, especially square-edged ones. If properly executed, parallelogram forks can also exhibit quite good torsional stiffness, as widely-spaced pivots are theoretically better at fighting twist than a pair of braced telescoping tubes. And then there’s the anti-dive part: under hard braking, telescoping forks have a tendency to dive into their travel, quickening steering and shifting rider weight forward at what could be considered the worst possible time (or leaning heavily on dampers to mitigate dive). Much like VPP-style suspension systems can be tuned to use chain forces to stiffen against the rider’s weight shifts, parallelogram forks can be designed to use braking forces for the same. The result, at least in theory, is a fork that maintains the bike’s geometry and front suspension action under braking. There’s also the potential for quite light weights – Motion is claiming 1.5kg (3.3lb) for the planned CROSS cross-country model and 1.8kg (4.0lb) for the GRAVITY trail/enduro version. 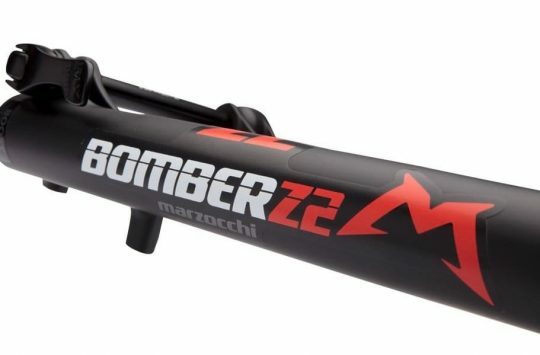 Those aren’t bad weights for 80-120mm 29er and 120-160mm 27.5 forks – though they do appear to be relying on a largely composite construction to keep weight in check. Suspension in both cases comes from a pair of carbon fibre arcs, interchangeable for rider weight and desired travel. Dampers are housed in the head tube and, at least on the GRAVITY, can be adjusted via the neon green knob that can be seen at the stem cap. As for Motion, the newly-formed company is dedicated to the principles of innovation, quality, performance and durability as well as the concepts of discovery and nature preservation, sports, well-being, respect, sharing, and self-transcendence. Founder Matthieu Alfano is also committed to French production, which likely accounts for part of the forks’ forecast 1,920€ (£1,410) sticker price. 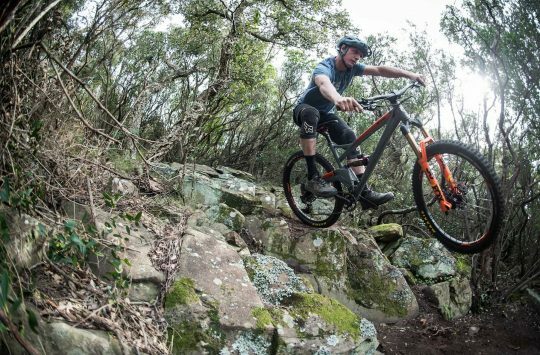 The CROSS and GRAVITY are scheduled for late-2016 release, however those looking to get in on the action early can (until 31 October) apply to be members of a prototype test team to provide feedback prototype forks’ performance. Programme PRECURSEUR, presumably limited to residents of France, requires a 1,000 (£735) deposit, which is refundable on return of the fork or can be used for its purchase at the end of the program. Given the number of companies accused of using their customers as beta testing, we suppose that it’s nice that one is being up-front and offering a discount for the practice. Does it work? Caminade (whose French-made steel full suspension bikes we’ve featured previously) seem to think so, saying (roughly) The dynamic behavior of the prototype fork turned out to be beyond our expectations, with sensitivity and progressiveness important for comfort and grip, and the ability to keep 100% of the usable travel even on heavy braking… The fork had lightness combined with good stiffness too. So they liked it. 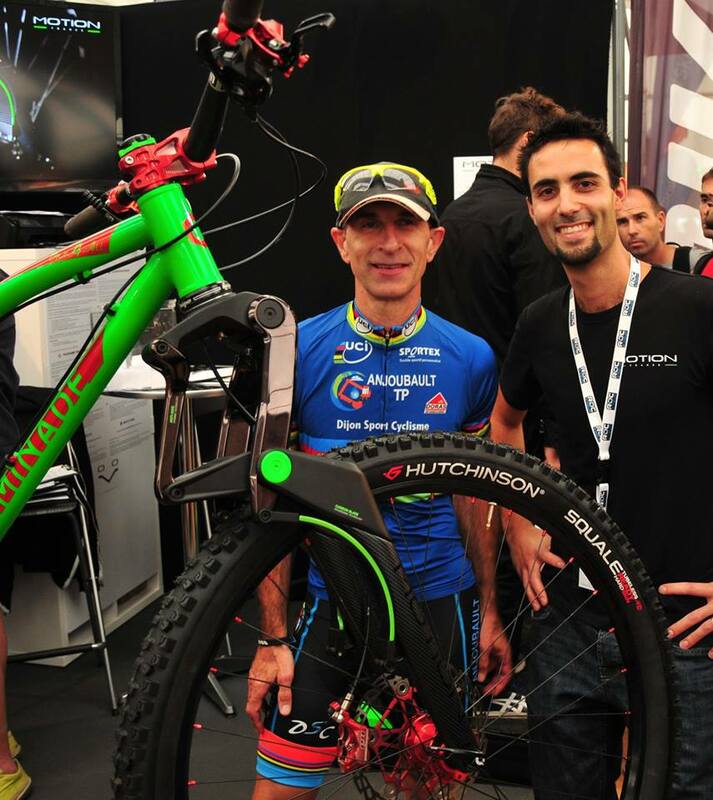 One of the beauties of the bike industry is its attractiveness to quite bright people (who could often find a far better living elsewhere) and their unique visions. Many designs prove to be expensive novelties – but every once in a while something breaks through and makes riding better for everyone. It will be interesting to see where Motion falls between these poles. I tried a Whyte with a PR1stn? or whatever it was called. Riding a steep, relatively easy, switchback the front wheel tucked back into the frame and pitched me OTB. I see no advantage in the wheel path being up and back. Four bar systems can be tuned to allow chain tension to pull against the wheel path, countering the weight shifts (legs/body) that can cause bobbing. The examples that come to mind are URTs or a BB-concentric system (like Kona’s singlespeed full susser way back when), both of which bob noticeably during seated pedaling. The effective chainstay length cannot change and chain tension can have no tension on the suspension, but the rider’s movement over the course of a pedal stroke still causes unwanted movement. VPPs and the sainted Maverick Monolink use a slightly expanding bb-axle distance to use chain tension counter this effect. Have I got it all wrong? Where’s the ‘chain tension’ on a fork? D’uh. The “back and up” wheel path thing really is total rubbish. Hint: Do a simple vector diagram, and look how much rearwards travel is required (vs upwards travel) to even move the resultant vector slightly. Unless you ride at less than 1mph everywhere then it’s never going to make any difference! Marc. Singlepivot bikes do this too, providing the antisquat is positive (roughly explained by saying the pivot should be above the chainline, though it’s not as simple as that at depends on wheel centre and pivot location too, and of course, how the shock is driven – by linkage or directly on the swingarm – is irrelevant). It’s not a VPP or Maverick exclusive thing. You also keep using the phrase “parralelogram” in the article, and then make your excuse at the bottom. It’s a four bar linkage. Point taken about anti-squat single-pivot frames- though there aren’t many single pivot forks out there to compare to and the tuning of a single pivot wheel path (a simple arc) can’t be nearly as complex as a four-bar (for better or worse). You’re right on the parallelogram bit as well- though the indicating asterisk is at the first use of the term. Much like “alloy” is an imprecise but generally-accepted bike-world reference to aluminium, most folks understand that “parallelogram” refers to Girvin, Amp, and company. That’s correct, as noted above there is no chain tension in play at the front wheel. In Motion’s vision, it’s braking forces that resist weight transfer-induced suspension travel. All I can think is how much it will hurt if you tangle with it in a crash. very interesting discussion about the theory of suspension systems, but …….. £1,410 ! I have a bike made of brass…….its an alloy bike ! Well, it’s certainly absorbed a big hit from the ugly stick. Another Prst1 past owner here who will be happy to never again experience the OTB’s induced by that up and back front axle path. Theres plenty of rear suspension designs that look ugly, we’ve just got used to them looking that way. I think there are only two issues that really matter. If it works first. If it does what it says without producing the negative results experienced by passed whyte owners then it has to be good. Then theres the price. I assume if the first issue is overcome then volume can deal with the second. I had a PRST-1 and a PRST-4, I’d happily have the PRST-4 back, it’s still one of my favourite bikes. I think the single pivot rear of the PRST-1 made it more prone to spitting you over the bars (4 stitches in my left cheek to prove it). Never took off on motorcycles because you need the forks to compress under braking to provide weight transfer which in turn increases tyre grip. Try moving your weight back and grabbing the front brake, not as fun as it sounds!